"These have been around forever!" Mix flour with baking powder, spices and salt and set aside. Cream butter and gradually add sugar, beating until light and fluffy. Add the egg and both extracts. Beat well. Add the flour mixture, blending well. Stir in the coconut. Divide dough into two equal parts. Pat each half into a rectangle measuring about 10 x 9 inches. Chill if necessary to facilitate handling. Cut each rectangle into four strips lengthwise, then cut each strip into ten pieces. Place each piece 2 inches apart on ungreased cookie sheets. Use a floured fork to gently press ridges into the cookies. Bake for 8-10 minutes or until golden in a preheated 375 degrees F (190 degrees C) oven. 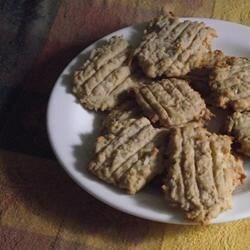 These cookies taste almost like I remember them.I used a Pastry blender instead of a fork made the job very easy. I'll add this to my favorite list.